Even today Naples is a place where dreams die swift and hard. Is it a municipality of 3.1 million, or 3.1 million anarchists haphazardly thrown into the same 45 square miles? As Western European cities go, Naples–like Marseille, Palermo, or Liverpool–invites adjectives such as "tough" and "gritty." It simultaneously fascinates and horrifies; nothing quite works, yet everyone is cheerfully resigned to muddling through as best they can. Let's just say that muddling through was considerably harder in the 1950s, a time in which Italy was struggling with its recent fascist past and cleaning up wartime devastation. The Camorra thrived in the vacuum left by effective government and was about the only thing that did thrive. Naples is the setting for Elena Ferrante's My Brilliant Friend, a novel that's like a Vittorio De Sica film set to type. The novel was originally published in 2012, but is now in a new edition as Ferrante has just published The Story of the Lost Child, the final book in a tetralogy known as "The Neapolitan Novels." 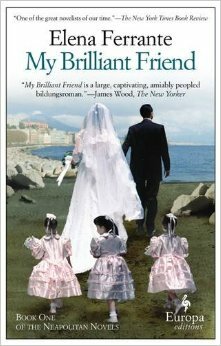 Its glowing reviews have set Ferrante novices such as myself back to book one, My Brilliant Friend. The book centers on the friendship between two girls, Elena and Lila, who grow up in a poor yet lively Naples neighborhood. The expectation for most girls is an elementary school education, then work, early marriage, and motherhood. To get beyond the sixth grade, as Elena manages, involves passing rigorous exams, scrapping together tuition money, borrowing grubby books, and working with tutors to master subjects such as Latin, Greek grammar, English, and philosophy. What are the chances that the daughter of a shoemaker can do this? My Brilliant Friend is often hailed as a story of female friendship and so it is, but it's far more than this. In the hands of a lesser writer the story might be little more than a hardship versus perseverance tale; in Ferrante's hands the struggle to acquire knowledge is a mere foil for peeling back the layers of a Neapolitan onion for its textures, cadences, smells, and daily struggles for survival. It's also about the randomness of life's chances. As Lila prepares for marriage at age 16, she calls Elena "my brilliant friend," which we recognize as doubly ironic as it is she, not Elena, who should be the scholar. Elena is bright enough, but it's Lila who is her greatest tutor–the one who borrows Latin grammar books from the library to tutor Elena. Lila is stoic on the surface, but is she also vicariously living her first best destiny through Elena? Place our two characters in the insalde miste context of a neighborhood of ex-fascists, pastry chefs, low-level criminals, casual workers, poets, widows, housewives, tinkers, beggars, and ironclad patriarchy and you have a book that feels 'bigger' and more sprawling than its 331 pages. It's also as enigmatic as Ferrante, a beloved author whose identity is unknown and might not even be female, though the author claims (on the web) to be a mother. Ferrante is a heck of a writer, whoever he or she might be. My Brilliant Friend skirts the edges of magical realism without actually going there, a deft bit of writing that bathes characters and circumstances in a glow that's also quite Neapolitan. Imagine growing up in Naples but never visiting the sea until you are well into your teens. Imagine living under skies that dazzle, but knowing more darkness than light. Imagine and dream, but don't trust the latter. Don't believe any remarks that pigeonhole My Brilliant Friend in that sexist sinkhole labeled "chick lit." It's about humanity and I look forward to wending my way through the three remaining books. From where I now sit, Elena Ferrante feels like an Italian Marcel Pagnol.